I’m not exactly sure whose bright brainchild this was, but British curator David Elliot was quoted in the article as being the lead – in short three artists have been commissioned to do a portrait of the dead Muammar Gaddafi. All three are painters, and I wonder if the small number is due to the sensationalism of this. 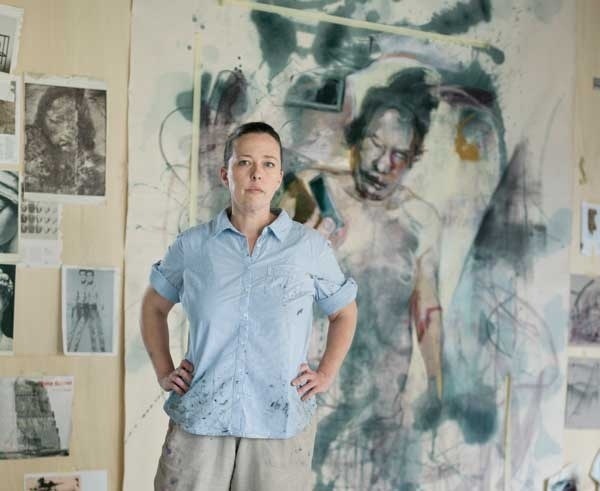 One, a YBA grown accustomed likely to Damien Hirst antics, Jenny Saville. A Chinese artist likely used to anti-Western sentiment, Yan Pei-Ming, the second. Lastly the Italian artist Luca del Baldo. The work is due to be shown in Italy this December. Of the three artists Mr. Baldo seems the artist regularly obsessed with death in his paintings. I’m afraid he thinks this is a unique and daring ledge to stand on from an art standpoint. What he doesn’t realize is that we are all obsessed with death, and it is neither glossiness or sensation that will ever move people truly with respect to death. Death is a mystery, a mystery can be explored on many levels and not most effectively with the obvious. His work reminds me of playing tennis with someone who after a long rally dribbles the ball over the net to win a point. I challenge these “great painters” to commission portraits and memorials to the people killed by Gaddafi’s injustices. The Lockerbie bombings come to mind, the funded genocides, the official training of leaders to enact genocide, night club bombings and civil wars. Can these artists step up to the challenge of compassion? Instead of a literal and awkward painting of a dead man? Why not paint all the other dead men and women – those who were never put on pedestals? If this was indeed David Elliot’s idea, I somehow wouldn’t be surprised. He recently curated the Kiev Biennale – the city’s first ever in 2012. I read his “mission” statement, which read like a pamphlet to visit Kiev, and not so much on a vision for this first seminal edition of the Kiev Biennale. The participants seemed a chocolate box of choices, and the curatorial vision was unclear. Maybe this was a soft launch and they will have more direction in 2014. For a curator who seems to enjoy politically charged ideas, why was the mission so safe in one of the most politically charged venues? Dead celebrity paintings are a new low point for painters I think. Looking for some more brave approaches – touch on the darkness, it’s necessary to life, but let’s have depth people! !